Taste test: These chips have a mild vinegar taste and a moderate level of salt. If you eat a couple of them in a row, you'll get a strong vinegar kick. They're OK. 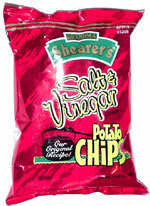 I was impressed by how many chips Grandma Shearer included in this one-ounce bag.